to become a leader in our field. AlexProSoft is a software company that provides web-based solutions, mobile applications, analytical tools, and websites designs. We started in 2010 with a simple goal, to become a leader in our field. As part of that ambition, we strive to help our customers realize their full potential and also present it in the best way possible to the market. We provide these services in the most efficient, robust, reliable and cost effective manner. Our mission is to understand the needs of our business partners and turn their ideas into highest-quality and most cost-effective software solutions in reasonable time. We achieve that by embracing new technologies, applying best practices, following creative approaches, and adopting continuous improvement. We don't just build software, we help you build, monitor and control your business. We offer high quality and reliable solutions which we attain by maintaining balance between designing, technology & business needs. We extract your transactional data to build dashboards which let you monitor and control your business. We build robust and flexible mobile applications on all mobile platforms to allow our customers to access and moitor business at their fingertips. 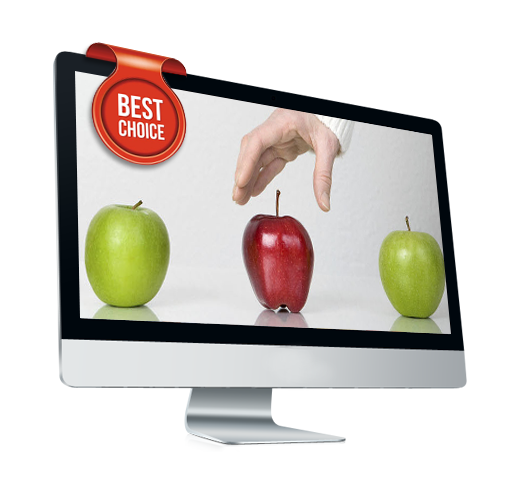 Our websites are professionally designed, informative, interactive, fast-to-load and easy to navigate around. We follow simple methodologies that help us succeed through every customer engagement. This creates an environment where everyone wins. When you choose us, you're not just choosing a software company. You're choosing a team that understands your needs, identifies your business strength and turns your ideas into tailored software solutions. Through adopting agile development process, we design and present interactive prototypes that communicate and detail the approach we are taking to the solution. This allows our customer to work closely with us in designing the ideal solution to his business vision. We are committed to excellence in the solutions we provide. We continually strive to exceed our customers' expectations by setting the highest possible standards, and continuously measure how we stack up against these goals. By doing that we ensure quality is built into the core of our services. Since our customers are the foundation of our business, then integrity is the cornerstone. Everything we do is guided by what is right. We live by the highest ethical standards, treating our customers, partners, competitors, and coworkers with fairness, honesty, and respect. We deliver stable, incremental releases containing new improvements at regular intervals for customer review. This gives our customer high visibility during development, and gives us the opportunity to improve user experience based on ongoing feedback as development progresses. We are performing in the best possible manner with the least waste of time and effort. We are convinced that there is always a better way, and we are constantly looking for it. We don't fear change; we embrace it. As a technology company, we recognize that greatness today will become obsolete tomorrow. In today's changing world, we are highly regarded as a creative problem-solver able to think laterally, that is, 'outside the box'. We are able to apply this creative force to everything we do, to ensure our customers' success. We offer reliable solutions which we attain by maintaining balance between technicality & business needs. Our solutions are professionally designed, informative, interactive, fast-to-load and easy to navigate around. As with most successful organizations, we face a choice between pursuing new opportunities and, at the same time, ensuring that existing customers’ needs are met. Our ability to harmoniously operate as a self-sufficient development unit, with its own project management, leadership, and development staff allows us to efficiently satisfy the needs of both existing and potential customers. Software teams often charge development costs that are fixed regardless of their actual productivity. Several factors can negatively affect developer productivity and increase development costs. Our trained developers can complete projects in less time at less cost since we only charge for actual development hours the costs of which are agreed upon at the start of the project. Organizations often need to utilize new technologies with which the development team has little or no experience. This leads to increased costs and schedule slips. Due to our vast knowledge and use of latest technologies, in addition to having an extensive experience in almost every major software development environment, we can create a fixed cost plan and accurate deadlines for the entire project. Many software projects suffer from strict timeline constraints. Since we operate as a self-sufficient development unit, we can dramatically increase the capacity dedicated to a software project in a risk-controlled and cost-effective manner.This turns around projects that are behind schedule and allows our customers to free up their resources and let them take advantage of an unplanned opportunity. Ours is a business founded on intellectual property. We foster a creative environment in order to develop highest-quality solutions and deliver them via the most effective channels. We always come up with wealthy innovative ideas to ensure high quality and cost-effective solutions. We constantly evaluate and improve our processes in the light of their efficiency and effectiveness. With a positive attitude we see the bright side of life, become optimistic, and expect the best to happen. 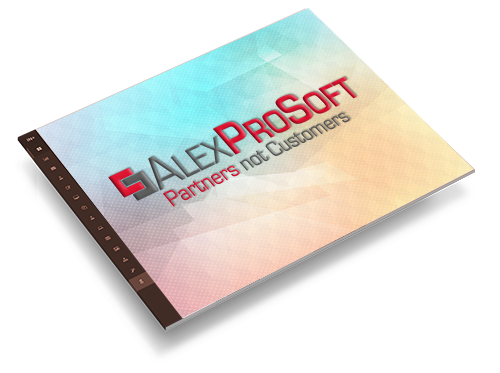 AlexProSoft is a software company that provides web-based solutions, mobile applications, analytical tools, and websites designs. We started in 2010 with a simple goal, to become a leader in our field. 2017 © Alex ProSoft. ALL Rights Reserved.